It's time to celebrate the blooming of tulips at the Skagit Valley Tulip Festival. 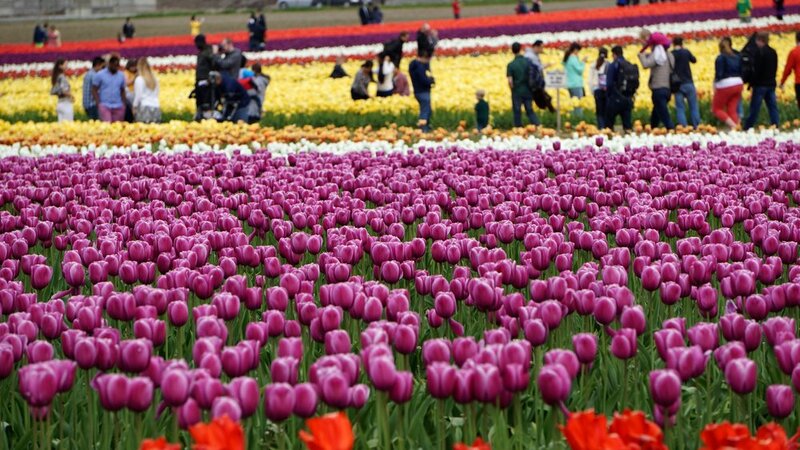 For the last 32 years people from around the world come to see the beauty of these flowers from April 1-30. Each spring brings visitors in the hundreds of thousands and it's easy to see why. The fields of vivid colors with mountain backdrops and tulips in the millions is a gorgeous sight to see. We spent two days in Mt. Vernon exploring the fields and downtown area. Prior to 1984 two Chamber of Commerce directors noticed that people in the thousands had been coming to the Skagit Valley to see the tulips bloom each spring. They chose to act on this by holding a yearly tulip festival which included events and festivities for these visiting tourists. 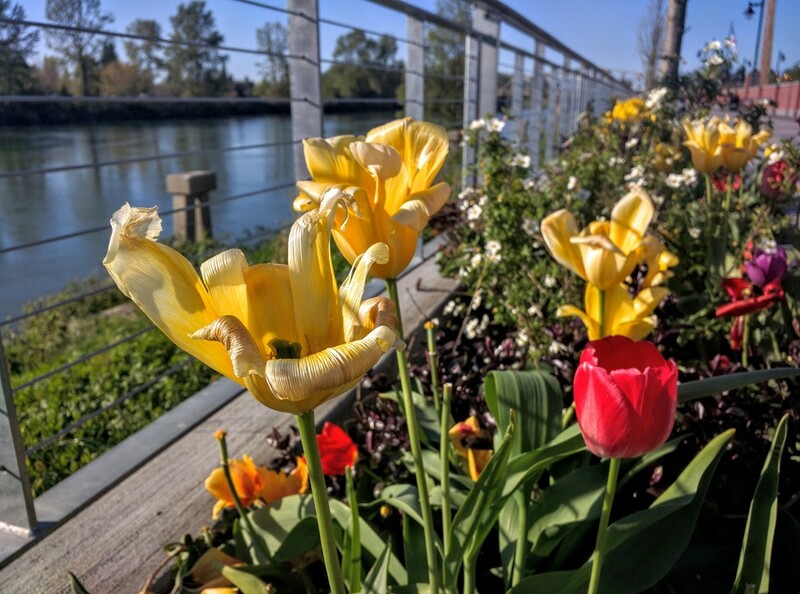 In 1984 the Mount Vernon Chamber of Commerce officially inaugurated the Skagit Valley Tulip Festival and it grew from a 3 day event to a 30 day event due to Mother Nature and her decision on when the tulips would bloom each year. The festival eventually broke off of the Chamber of Commerce and became its own entity. Today the fun continues with concerts, tours, events, art shows, fun runs, bike rides, and more. And let's not forget about the local businesses that provide some great food and drink! Our plan for the weekend was to see the tulips on Saturday, stay the night in town, then hike on Sunday. We checked into the Best Western Plus Skagit Valley Inn around 3, then headed into the downtown area for some food and drinks. Knowing the traffic was going to be bad we parked a block north of Division St. and walked the rest of the way to our destination. There's a nicely paved Skagit Riverwalk that parallels the river for a mile. The walk was plentiful of flower gardens with tulips, views of the river and downtown scenery, with a lot of people strolling around on this beautiful, sunny day. We headed south, crossed under the bridge, and reached Trumpeter Public House for dinner and a couple drinks. We sat outside on the patio, overlooking the river and all the people out and about. The service here was great. Our thirst was quenched with a couple Bloody Mary's and local pale lagers. Two Garden Wraps took care of our appetite. After eating we strolled along the riverwalk some more, taking photos and enjoying the day. We decided it was a little late in the day to go see the tulip fields so we headed back to the hotel for the night. The two hour drive, food, and drinks had us sleepy and we hit the hay early. The next morning we made a change of plans. We'd go see the tulip fields but we would not hike. Instead, later that day we would head to a state park that's been on our list for awhile now. That story will be coming in the future. First things first, it was time for breakfast. Calico Cupboard Cafe and Bakery is where we headed, downtown again. The place was pretty busy, we waited about 30 minutes for a table. During the wait we browsed Re-Feather Your Nest, a consigned home furnishings store. It's connected to the cafe by a walkway inside the building. We ate Skagit Hash and veggie Benedict, both great tasting items. On to the tulips. There are two main tulip fields in the area, Tulip Town and RoozenGaarde, we chose the latter. The entrance fee is $5/person and parking is free; they accept cash and credit. Upon entry there is an ornamental windmill and numerous smaller planting beds of tulip. A large covered area is set up to buy bulbs. There are concessions for food and drinks as well as portable bathrooms. Off to the left of the entrance is a path through a tulip garden and grassy area for sitting. If you continue straight ahead, behind the windmill, lies the expansive rows of the tulip fields. The vivid stripes of color look like the exotic flag of some far flung country. You'll also see rows of recently cropped flowers with brightly hued petals strewn between them. Hats off to RoozenGaard for the planning and effort that goes into putting on this incredible display! The tulip fields are abuzz with people right now. The crowds are something to consider when planning your visit. Putting up with the crowd however, is worth the rewards of seeing these beautiful flowers in person. The intensity of the colors and number of color combinations is awe inspiring. This place is a photographer's dream. You'll likely see many people using the tulips as an amazing backdrop. There are also bulbs for sale, so your enjoyment doesn't have to end when you leave the farm. Like the glory of a sunset, the opportunity to appreciate these gorgeous scenes is fleeting. If you have the chance, get out there and visit Skagit Valley!